The ruling Chinese Communist Party is consolidating its centralized power over China by transferring control of the 1.5 million-strong paramilitary police force under the People’s Liberation Army (PLA). The People’s Armed Police will be under the direct control of the Central Military Commission (CMC), a body headed by President Xi Jinping, , state media reported on Dec. 27. 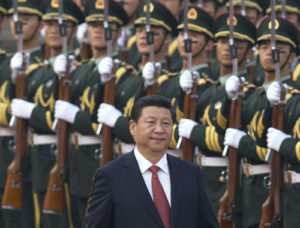 In 2014, the top leaders of the People’s Armed Police were replaced with PLA officers. Xi ally Wang Ning, who had no police force experience, took the helm. “The main reason to move the armed police directly under the CMC is to put all China’s military power in Xi’s hands,” said Hong Kong-based China analyst Johnny Lau Yui-siu. Zeng Zhiping, a military analyst at the Nanchang Institute of Technology in Jiangxi, said the move was in line with the constitution. “The constitution says China’s military commission is in charge of all the country’s military, so putting the armed police under the CMC’s control helps to get the basics right to start with, but it will also improve the division of labor in the military,” Zeng said. The paramilitary police serve “as a backup for the military in times of war, and domestically has a role in putting down protests and counterterrorism – particularly in areas such as the restive far western Xinjiang region – as well as border defense and firefighting,” the South China Morning Post said in a Dec. 27 report. The move will become official on Jan. 1, according to state-run Xinhua.